This was FTCC's second set based on Star Trek III: The Search for Spock. There are 60 base cards with a 20 card laminated ship subset. The back of the cards featured the number of the card along with some text about the scene being shown. 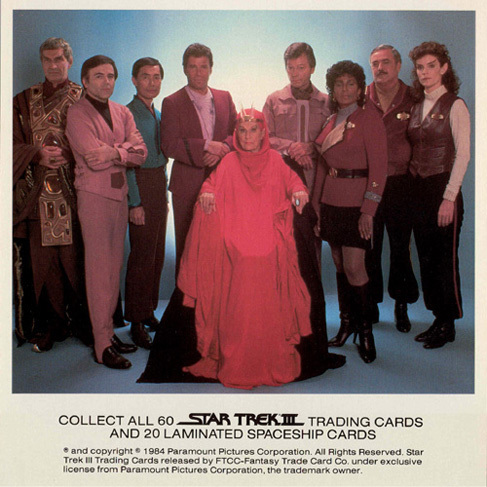 Two oversized promo cards (9½" x 9½") were produced for this set. 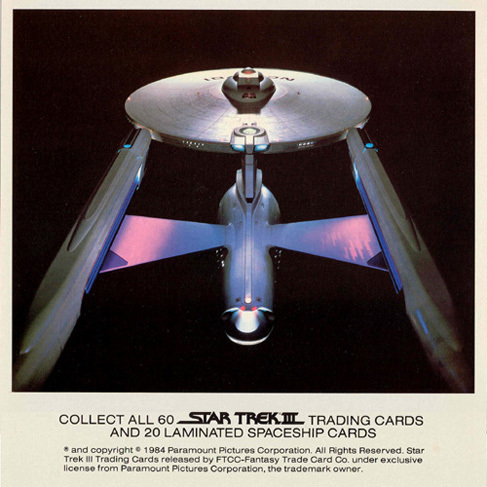 They are considered to be the earliest Star Trek promotional cards. FTCC 1984 c 350 boxes 36 4 + 1 ship card 2½" x 3½"
4 Chief Engineer Montgomery Scott played by James Doohan 24 Kirk and crew find Saavik and Spock held prisoner by Klingons 44 Which one shall I execute?